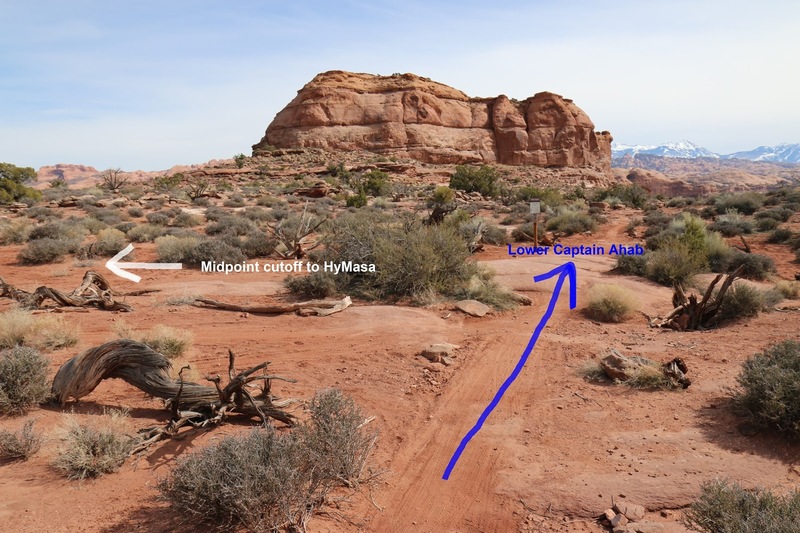 Upper Captain Ahab is located in the Amasa Back Area near Moab, Utah. The trail as we are describing it here is the top half of the Captain Ahab trail which begins at the end of the HyMasa trail and goes to a short connector near its midpoint that runs between the Captain Ahab and HyMasa trails. We broke our description of the Captain Ahab trail into the upper and lower sections to make the slideshow at the end shorter and because many people only ride one half or the other. The Captain Ahab trail is one-way in the downhill direction. 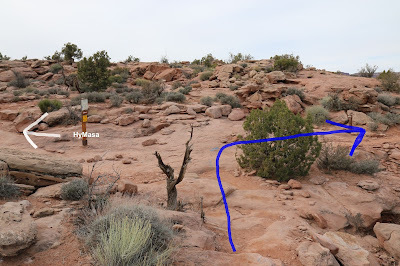 The upper section of the trail begins off of the Amasa Back road near the top of the HyMasa trail. 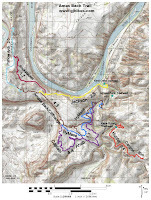 Most of the trail junctions in the Amasa Back area have trail signs with locator maps on them although it is still nice to print out a map to take along. About a hundred yards or so from where the trail begins off of Amasa Back it makes a sharp right turn as it passes the top of the HyMasa trail. As the trail continues it climbs steadily for the next 3/4 of a mile or so. The profile map of the trail makes it look steeper than it seems when riding it but it does do a good job of pointing out the climbing that takes place. 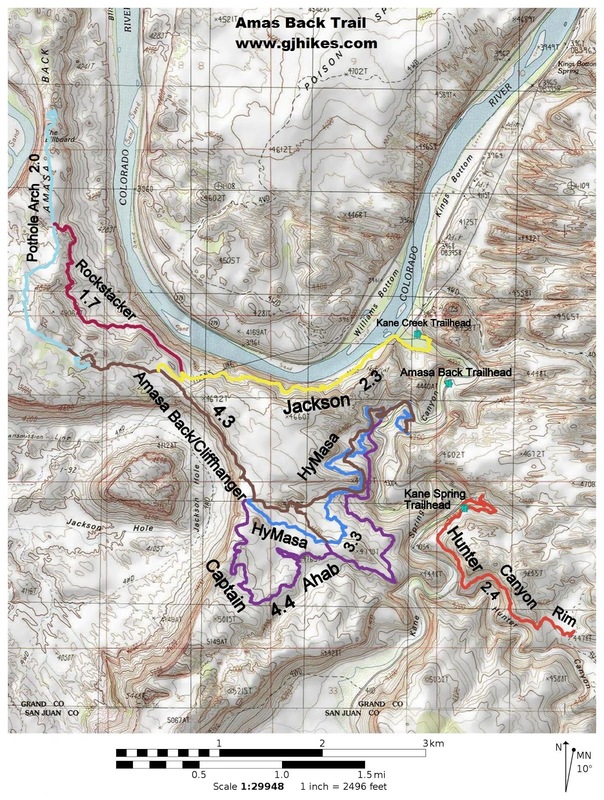 There is only about 30 feet of difference between the beginning of the trail and the midpoint where we transition to the lower section of Captain Ahab but there is a lot of elevation change in between. The upper portion of Captain Ahab doesn't have any places with a lot of cliff exposure but it does get close enough that you can look out over the Colorado River where Dead Horse Point and the Island in the Sky District of Canyonlands National Park make up the distant horizon. Upper Captain Ahab has a lot of broken slickrock, rock shelves, and ramps that is travels over. The trail was constructed well enough that most of the transition points are easy to moderate in difficulty. There are a few places that require advanced riding skills or necessitate the need to dismount and walk. The first good downhill section drops from the trail from its highest point to a lower area of slickrock. From there the trail regains a lot of the lost elevation but at a more gradual rate. There are plenty of spots to negotiate that add to the trails character and make it fun to ride. It never hurts when there is so much world class scenery to enjoy either. In case you are wondering how the Captain Ahab trail got its name we've included a photo of Whale Rock. It isn't white but it is pretty big. The end of the upper section of the Captain Ahab trail comes up just before reaching Whale Rock where there is a short connector trail referred to as the Midpoint that runs back over to the HyMasa trail which is less than 500 feet away. The lower section of the Captain Ahab trail is much more technical in nature, with areas of cliff exposure and many more technical challenges to deal with. The cutoff trail provides the opportunity to skip that portion of the trail although in doing so you end up missing out on some terrific views. 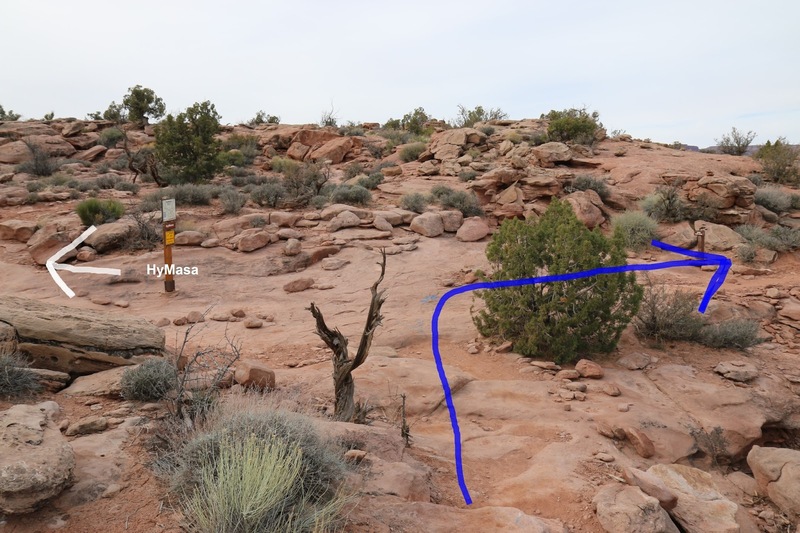 There are also people that get off more on the technical challenges of the lower section, or don't have the time for the full loop, that make use of the connector to begin the Captain Ahab trail at this point. Whatever you choose to do if you would like to see it for yourself then all you have to do is grab your bike or 'Take a hike'.